Captured by NASASpaceflight.com forum user “bocachicagal”, the second of several massive liquid methane tanks has arrived at SpaceX’s prospective Boca Chica, Texas facilities, to be dedicated to integrated testing of BFR’s spaceship/upper stage. If there was any doubt beforehand, the arrival of a second ~100,000 gallon vacuum-insulated tank all but guarantees that SpaceX is planning a major campaign of BFR spaceship testing in South Texas – with as much as 200,000 gallons of storage capacity in those two tanks alone, SpaceX could easily top off two Falcon 9’s with liquid oxygen and still have more than 100 tons left over. Per NASASpaceflight.com’s forums, it appears that this newest tank arrived at the site sometime yesterday or the day before. 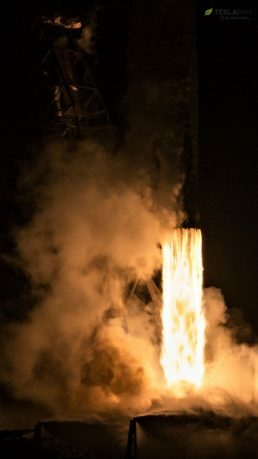 Thanks to the fundamental properties of BFR’s planned liquid methane and oxygen fuel and oxidizer, aspects of basic ground support infrastructure may actually be a significant improvement over Falcon 9’s refined kerosene (RP-1) and liquid oxygen, and dramatically superior (at least in a logistical and practical sense) to hydrogen/oxygen, a popular choice for many rockets. In terms of volume and density, oxygen is about 2.5x denser than methane but optimally combusts at a ratio of roughly 3.5 parts oxygen to 1 part methane (3.5:1), with SpaceX likely to operate the Raptor engine closer to 3.8:1. This means that – despite their major density differences – BFR’s oxygen and methane tanks will ultimately end up very similarly sized to hold ~230t of liquid methane and ~860t of liquid oxygen (2017 BFR numbers). As it relates to SpaceX’s South Texas propellant infrastructure, this likely means that a minimum of four large vacuum-insulated tanks will be needed to fully fuel a BFR spaceship (BFS), two for oxygen (~800t) and two for methane (~300t). 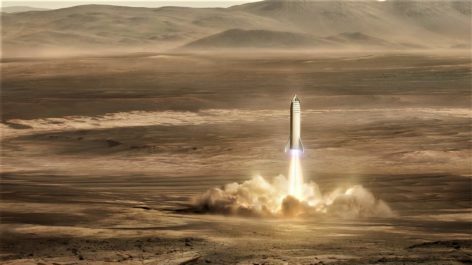 Depending on how SpaceX has structured its BFR infrastructure acquisitions, the two large tanks now present in Boca Chica could be more than enough to support a wide range of spaceship hop tests. A full load of fuel is almost certainly unnecessary – if not outright implausible – for BFS hop testing: with a full load of ~1100t of fuel and the spaceship’s total mass around ~1250t, all seven planned Raptor engines would need to be installed and operating near full thrust (~1400t, 14,000 kN) to lift the ship off the ground. For context, Falcon 9’s first stage produces a maximum thrust of roughly 7,600 kN at liftoff, while Falcon Heavy triples that figure to ~22,800 kN. 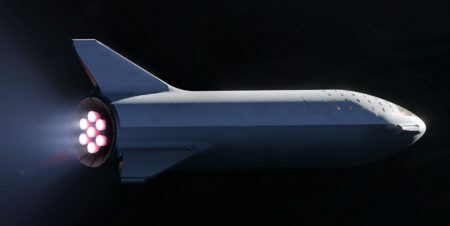 The spaceship/upper stage of BFR alone thus produces nearly two times as much thrust as an entire Falcon 9 at full throttle and as much as fourteen times as much thrust as Falcon 9 and Heavy’s upper stage, statistics that properly illustrate just how extraordinarily powerful BFR is when compared with the rockets SpaceX currently operates. BFR’s booster (BFB) is even wilder, featuring ~3.5 times as many Raptors and thus ~3.5 times as much thrust as the spaceship/upper stage. 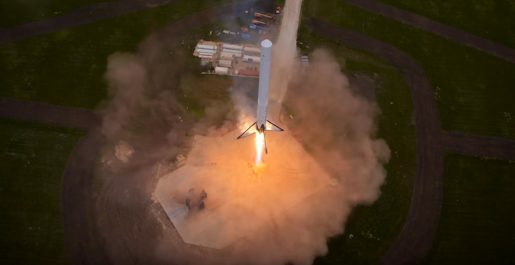 As a result of the sheer power of just the spaceship alone, SpaceX may have to move directly to a style of launch pad closer to that used by Falcon 9 and Heavy rather than the spartan concrete slab used for Falcon 9’s Grasshopper testing. 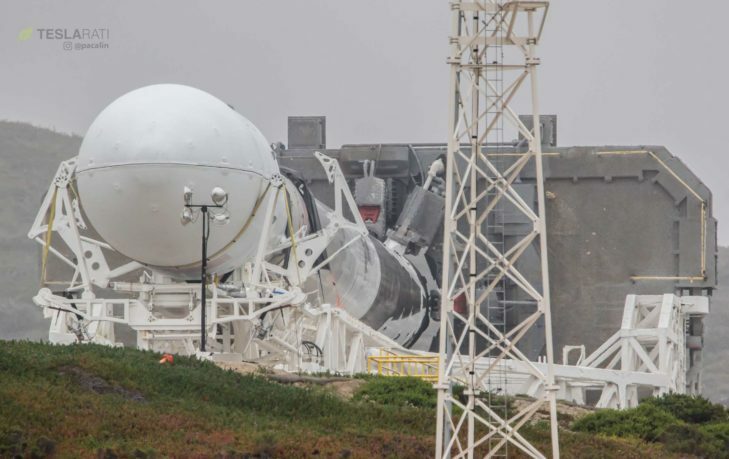 In this case, the rocket would be mounted some distance from the ground to minimize acoustic loads on the vehicle’s after and would likely include a water deluge system to further deaden thermal and acoustic energy while also minimizing damage to the concrete and metal structures that launch and landing pads are built out of. Above all else, the presence of not one but two huge ~100,000-gallon vacuum-insulated tanks at SpaceX’s Boca Chica facilities all but guarantees that the company intends to situate a serious campaign of BFR tests there, likely including the integrated spaceship hop tests both Elon Musk and Gwynne Shotwell have explicitly mentioned in recent months. Put simply, SpaceX has no other reason to be bringing massive cryogenic propellant tanks to South Texas – the company has plenty of space at any one of its three large launch complexes (not to mention McGregor) if it wanted to store those tanks elsewhere, and those three facilities already have operational propellant storage and loading infrastructure for Falcon 9 and Heavy launches. If more massive tanks continue to arrive or if it becomes clear that the two similar tanks present or solely meant for LOX or methane, the scale of SpaceX’s intentions in South Texas will become increasingly clearer.